I’m dreaming of a strong, brave nation that will defeat this nightmare called multiculturalism. This ugly bubble that our enemies live in will soon enough burst into a million little pieces. Our lives are entwined in these very harsh times. These are the days that will forever leave a mark on our nation’s future. I have strong belief in my fellow fighters. We will fight until the end for our homeland and one true Finnish nation. The victory will be ours. And I realised that very few of us really knew the real meaning of multiculturalism, which is the topic of Immonen’s post. Based on this hard multiculturalism vision, a war against multiculturalism was declared on November 5, 2011, by British Prime Minister David Cameron (the article from The Independent can be read here). In fact, as explained in the article and his speech, Mr. Cameron blamed a doctrine of “state multiculturalism,” which encourages different cultures to live separate lives. This, he says, has led to the “failure of some to confront the horrors of forced marriage.” But he added it is also the root cause of radicalization, which can lead to terrorism. Before him, German Chancellor Angela Merkel and French President Nicolas Sarkozy have declared multiculturalism a failure. For them, it has created some trouble in the two countries. But what they said was, in fact, the recognition that there was a problem with the public policies for the integration of certain foreign groups in these countries. The consequences of these interventions have been to push more for asking all immigrant groups to better integrate into the culture of the country where they live. In his defense, Immonen has referred to Cameron’s speech and he may, in fact, have tried in his post to copy Cameron. But Cameron did not stop at declaring a war against multiculturalism. He explained what he meant and it was less violent and easier to understand than Immonen’s declaration. Considering Immonen’s background, everybody has considered it as an expression of racism, but the explanation is probably quite different, particularly considering that Immonen is married to a Bosnian Muslim. Although his declaration was particularly clumsy and has hurt a large number of people, it may be a deliberate violent provocation. However, it would not have been taken as a racist declaration had it been toned down and rewritten. It is interesting to know that Finland scores quite well in terms of a multicultural policy. There is a well-known project from the Queens University in Canada called “Multiculturalism Policy in Contemporary Democracies.” It monitors the evolution of multiculturalism policies in 21 Western democracies, including Finland. The project is designed to provide information about multiculturalism policies in a standardized format that aids comparative research and contributes to the understanding of state minority relations. Then each country has a score, which is called the Multiculturalism Policy Index, based on a number of indicators covering eight aspects of multiculturalism policies: legislative affirmation, school curriculum, media representation, exemptions from dress codes, allowing dual citizenship, funding of ethnic organizations, minority language education, and affirmative action. A rating between 6 and 8 is considered strong, 3 to 5.5 is modest, and under 3 is weak. There is a second index, which is called the Migrant Integration Policy Index, a project led by the Barcelona Center for International Affairs (CIDOB), an independent think tank that promotes global governance and good practices; and the Migration Policy Group (MPG), an independent non-profit European organization dedicated to strategic thinking and acting on equality and mobility. The project conducts a complete review of integration outcomes, policies, and beneficiaries in all EU Member States, Australia, Canada, Iceland, Japan, South Korea, New Zealand, Norway, Switzerland, Turkey, and the USA. It provides a global score for each of the countries, based on 167 indicators. Its results confirm the results of the Canadian surveys for Finland. On a possible score of 100, Finland scores 69 (click here to see Finland’s data), at the rank 4 of 38 countries. It is not as high as Sweden (78), Portugal (75), and New Zealand (70), but at the same level as Norway (69) and comparable to Australia (66) and Canada (68); Belgium, USA, Germany, Netherlands, Spain, and Denmark are slightly below on the scale. • Increase the number of non-EU-born adults and youth obtaining FI professional and higher education degrees. • Increase non-EU-born’s uptake of work-based training and apprenticeships in the public and private sector across FI regions. • Speed up Finnish/Swedish learning through language courses that are better adapted to different skill levels and available both in urban and rural settings. • Remedy inequalities in health, education, and job over-qualification for immigrants from diverse linguistic backgrounds. • Recognize immigrants’ contributions to the economy, entrepreneurship, cultural and other inputs to FI. • Develop integration strategies for different vulnerable groups, e.g. foster home systems for unaccompanied refugee children. All these elements would be interesting to take into account when having a public debate that President Niinistö desires, if the government is able to organize it. On Tuesday, President Sauli Niinistö said that he hoped the ongoing demonstration will steer the immigration debate in the right direction and added that the country needs a reasonable debate on the difficulties faced by both the immigrants and the immigrant recipient. (This is certainly desirable because the present situation must deal with a provocative post that can harm the whole country.) He indicated that if democracy runs its cause by violence – whether by words or deeds – it is violence towards all, which is a strong judgement against Immonen’s violent post. Niinistö added that the Finnish way of life has given room for diversity and for other customs. 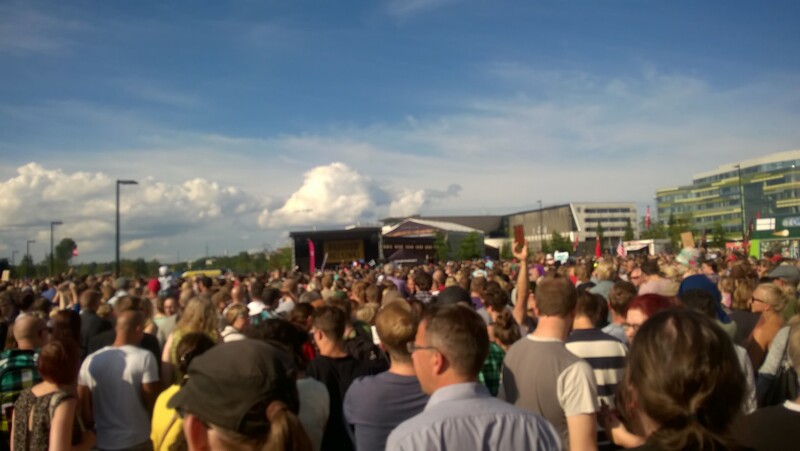 On one side, there are people who demonstrated to fight against racism and to have a more diverse Finland, a change for the future, when the world is changing fast. On the other side, there are a number of Finnish people who see that there are specific policies and resources for immigrants and who have the impression that more is done for the immigrants than for Finnish citizens. In order to reconcile these two approaches, other countries with more immigration experience, such as the USA, Canada, and Australia, which have had an active immigration policy, are representing interesting experiences in the field of multiculturalism. It would be interesting for the Finnish debate to have an analysis of these countries, which have quite different views of multiculturalism, from the American assimilation policy (the famous “melting pot”) to a certain Australian diversity. “In a descriptive sense, multiculturalism is simply a term which describes the cultural and ethnic diversity of contemporary Australia. We are, and will remain, a multicultural society. • Cultural identity: the right of all Australians, within carefully defined limits, to express and share their individual cultural heritage, including their language and religion. • Social justice: the right of all Australians to equality of treatment and opportunity, and the removal of barriers of race, ethnicity, culture, religion, language, gender or place of birth. • Economic efficiency: the need to maintain, develop and utilize effectively the skills and talents of all Australians, regardless of background. These dimensions of multiculturalism are expressed in the eight goals articulated in the National Agenda. They apply equally to all Australians, whether Aboriginal, Anglo-Celtic, or non-English speaking background; and whether they were born in Australia or overseas. • Policies that are based upon the premises that all Australians should have an overriding and unifying commitment to Australia, to its interests, and future first and foremost. • Policies that require all Australians to accept the basic structures and principles of Australian society: the Constitution and the rule of law, tolerance and equality, Parliamentary democracy, freedom of speech and religion, English as the national language, and equality of the sexes. • Policies that impose obligations as well as conferring rights; the right to express one’s own culture and beliefs involves a reciprocal responsibility to accept the right of others to express their views and values. One can hope that Prime Minister Juha Sipilä will use the opportunity to open the debate and solve the differences in Finland by finding a consensus for all to live together and that Deputy Prime Minister Timo Soini convince or exclude the few members of his party who are extremely racist. ‹ Will Prime Minister Sipilä act to convince Soini to be active against extremists in his party, or get rid of him and of his party? As a British person living in Finland for the past 8 years, i would suggest that Finland is more Orson Wellian, as in animal farm: “All animals are equal, but some are more equal than others” These more equal animals are in fact the Finns. I say this for a few reasons. Go to any 24hr ABC, or when you see any foreigner who is sweeping the floor at a shopping mall, or the majority of people doing what is considered menial jobs, and ask them what they were doing in there home country, i am certain that the answer would shock you. Most of these immigrants are highly skilled and educated individuals, but for some reason the Finnish Education system does not recognise foreign qualifications, which i find very bigoted. When these qualifications are not recognised, it in turn means that they are not educated. Do you not think this is a waste of valuable talent, that could be put to better use within the industrial/scientific workforce, rather than sweeping floors, or washing dishes? Many Finns are out of work, because they do not want to work, i know, as i have met many within my small town. I use to think that it would take the generation growing up now, to change the xenophobic attitude of Finland, but recently i have come to realise that it will take a lot more. David (IMechE,BEng) Currently working in a plastics factory.